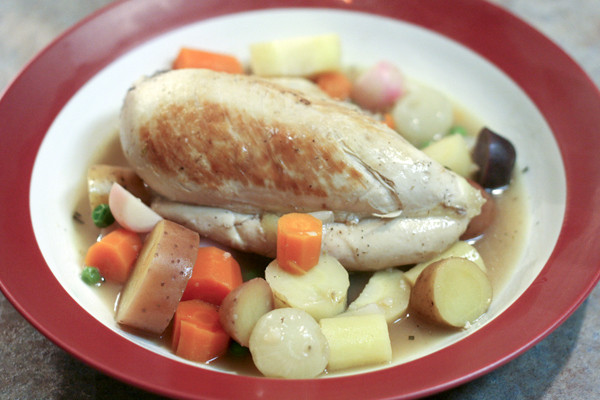 Oh winter, you bring such comforting foods; soups, stews, hot chocolate to keep us warm! But we have waited patiently and now the springtime is here and we can start to eat like it! Asparagus, onions, spinach. Such delicate vegetables. Soon we will start to see these spring vegetables at the farmers markets. 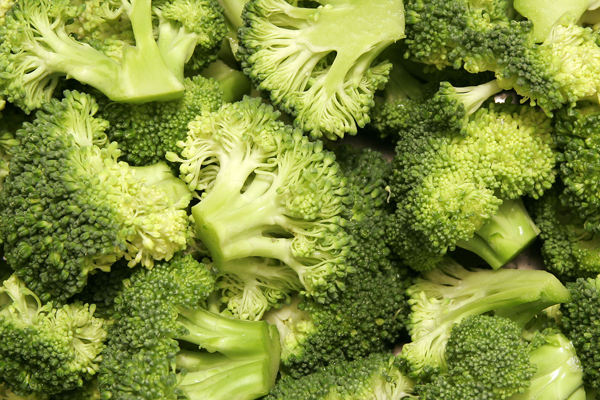 So many people don’t know what to do with these veggies. Steam or boil them is usually the answer I hear from my cooking class students at Happy Valley Learn to Cook. But, to really get all the flavor out of these delights, feature them in a main course like this Crustless Spring Quiche. Added to ingredients you probably already have in your refrigerator, this is an easy recipe that anyone can make. Invasive weed makes a great pesto! 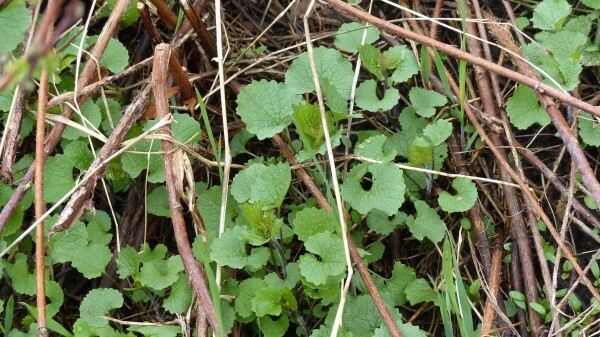 You’ve probably seen garlic mustard during a walk at a park or pretty much anywhere in Pennsylvania. It’s an invasive, noxious weed that features broad, round-ish deep green leaves, and eventually puts up a stalk of small white flowers. 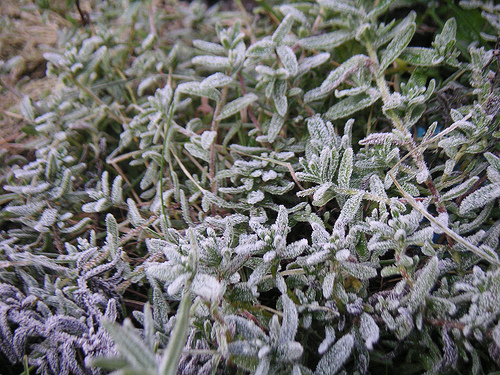 It’s a hardy plant, sometimes even growing right through winter if it’s mild enough. The plant is believed to have been brought here in the 1800s by settlers from Europe, and it has quickly spread. If left unchecked, garlic mustard can take over an ecosystem, and greatly harm native species. Deer do not care for it, so they end up eating competing plants, allowing it to spread even more efficiently. Most biologists encourage removal of this plant when you see it on your property, and a great way to do that is harvest it to eat it, as garlic mustard is actually edible. And one way to do that is make a spring pesto with it. 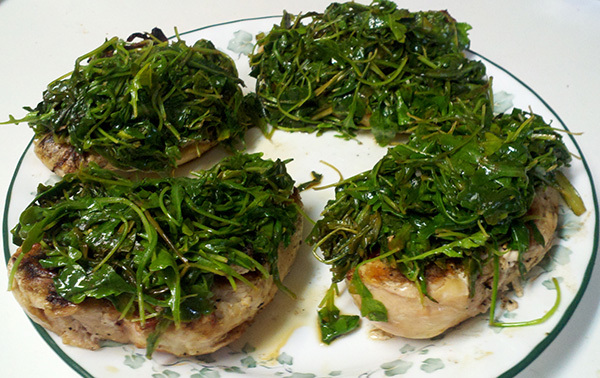 Continue Reading: Invasive weed makes a great pesto! While winter is back after going on an extended vacation, it’s time to start thinking about gardening because before long, all this snow will be just a memory. 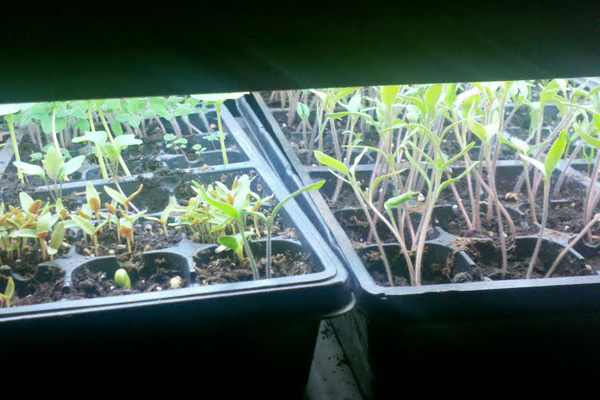 If you are a serious gardener, chances are very good you grow a lot of things from seed. 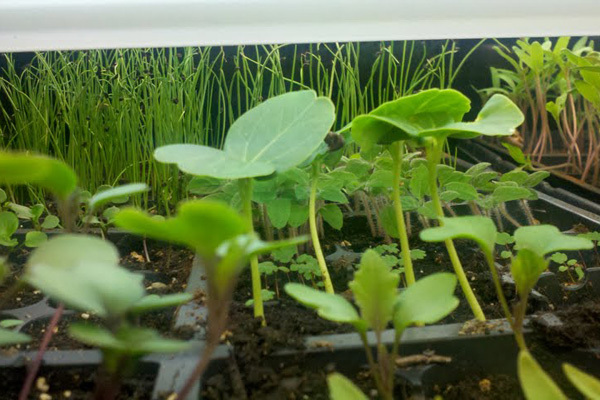 Many vegetable plants need their seeds started indoors so they reach maturity before our first frost of the fall. While the calendar says it’s April, the weather seems to think it’s February. With low temperatures in the teens and 20s this morning, it may have looked like spring with all the daffodils and green grass, but it felt like winter. It’s times like this that test the patience of a Central Pennsylvania gardener. The lesson learned here was simple; even if it’s warm in March, that doesn’t mean it can’t get really cold in April. And it’s this reality that really needs to be taken into account when starting a food garden in our area. The weather this week has caused many of us to catch a seasonal illness: spring fever. With temperatures more like May than March, the itch to start the garden may be really tough for some of us to resist. Is it too early to plant? Well, for the most part, yes. However, there are exceptions, but it will mean some extra work. Spring veggie breakfast casserole - great for potlucks! Memorial Day is over. The Northern and Southern guns at the Boalsburg Cemetery are silent, the homemade pies are eaten, and the carnival rides are gone out at Boalsburg’s Memorial Day celebration. But summer is coming with all its fun and wonderful garden bounties. 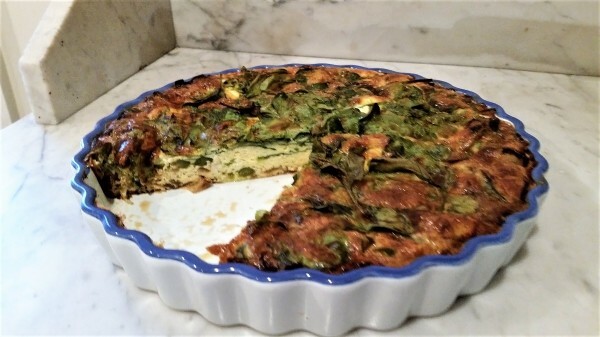 As spring fades into summer, be sure to make this easy breakfast casserole filled with healthy veggies from the local farmers markets before all the fresh spring vegetables are gone. Try this for your next large group gathering, family reunion, or anytime there are lots of people (or a few teenagers) to feed! 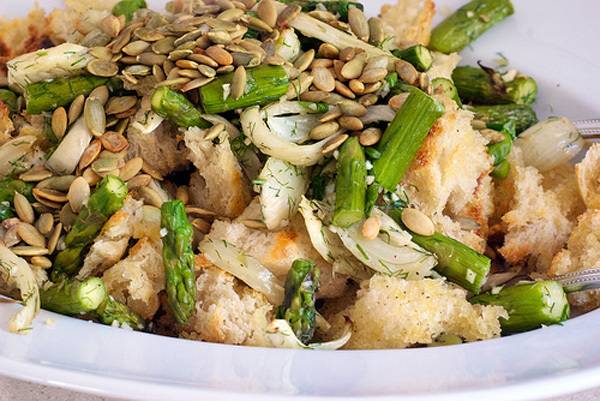 Continue Reading: Spring veggie breakfast casserole - great for potlucks! 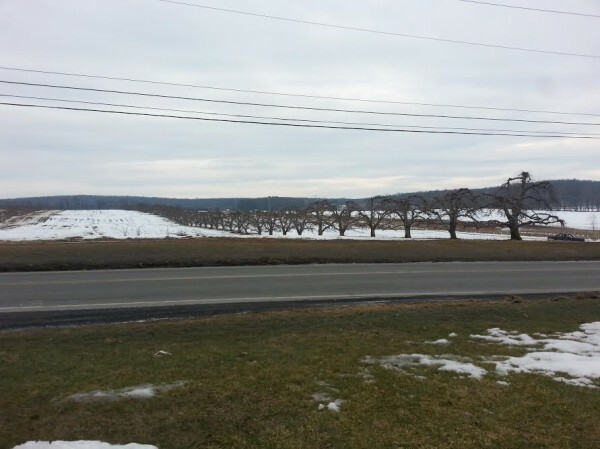 While you can find indoor versions of the State College, Millheim, and Boalsburg Farmers Market still going strong, the mild-ish weather recently has many people pining for the warm season and one big part of the friendly-weather months are farmers markets. 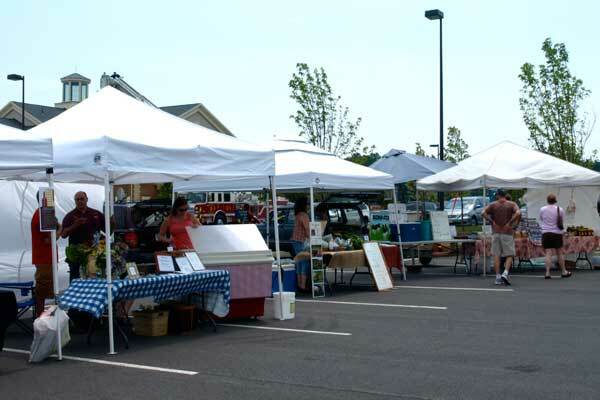 Believe it or not, we are mere weeks away from the openings of our selection of farmers markets. 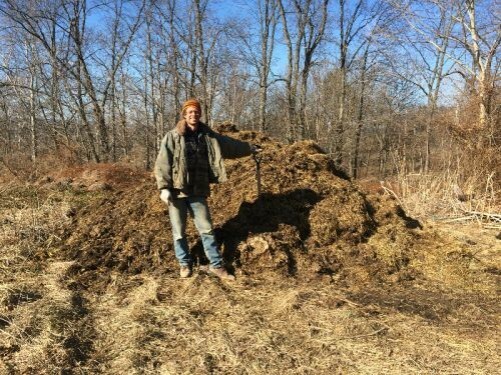 While it hasn’t been feeling much like spring, warmer weather is surely on its way, and the staff of the Jade Family Farm is hard at work to prepare for the spring season. Even though it still feels like winter some days, especially with the snowstorm on the first day of spring, that doesn’t mean that farmers get to take a break. 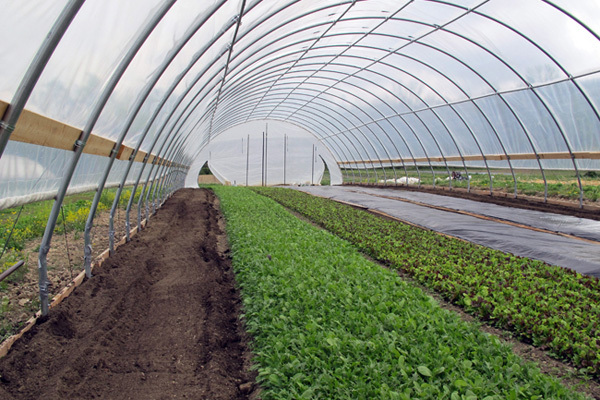 There is much preparation that goes into a farm having a successful growing season. It’s finally time to start seeds indoors! While it’s not very warm out at the moment, certain flowers and vegetables need an early start to ensure they will produce in the summer. Any thoughts that were planted the last few weeks that we will have a warm winter this year are currently lying frozen under a coating of snow. Winter has made itself known once again here in Central Pennsylvania. While flying flakes and howling arctic winds may not put one in a spring-like mindset, you can escape via seed company websites. There, you can have a virtual spring. But is it too soon to start seed shopping? Not at all! 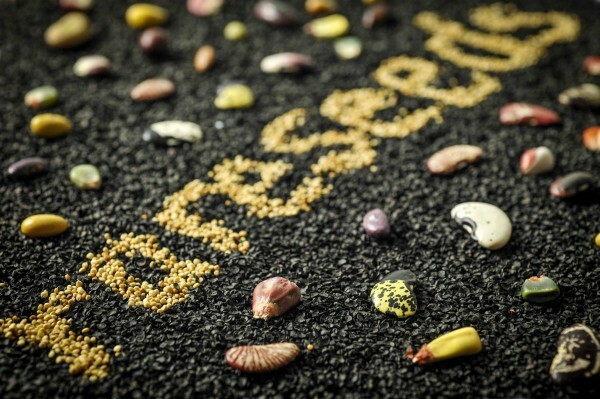 In fact, some seed companies sell out of interesting and rare varieties in January. The time is now to start planning and shopping for your 2015 garden. 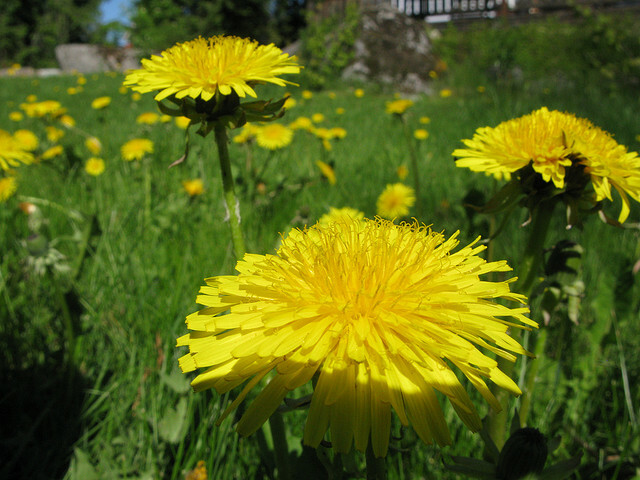 To many, the image above may cause anger because the dandelion is considered one of the worst lawn and garden weeds to control. 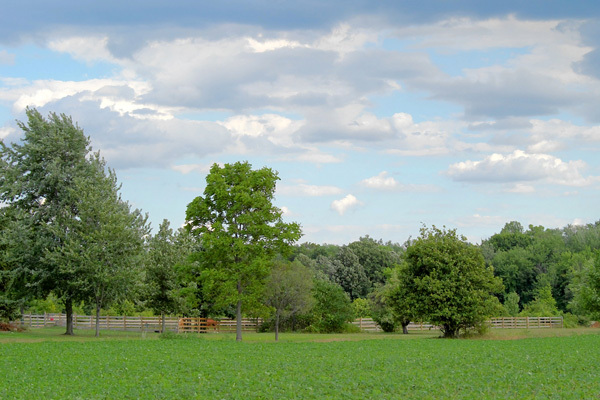 However, to many of the Pennsylvania Dutch persuasion, dandelions are good to eat and are a staple at the Easter table. They are, as we all know, quite plentiful and are ready to harvest right now so you can gather enough for Easter dinner. There are two key points to remember when harvesting dandelions. 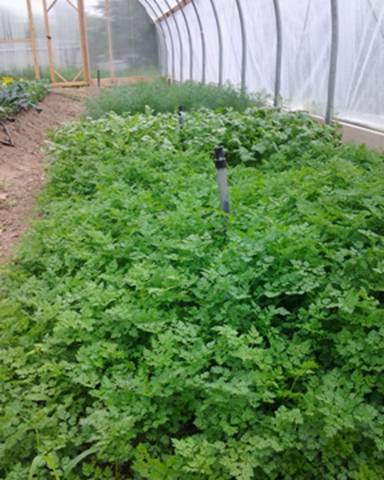 First, perhaps most importantly, make sure you are not harvesting greens from ground that has been hard hit with herbicides and other chemicals. In fact, there are cultivars of dandelions that you can grow in your garden. Second, you must harvest the greens before the flower head appears. Once that happens, they become so bitter they are inedible. 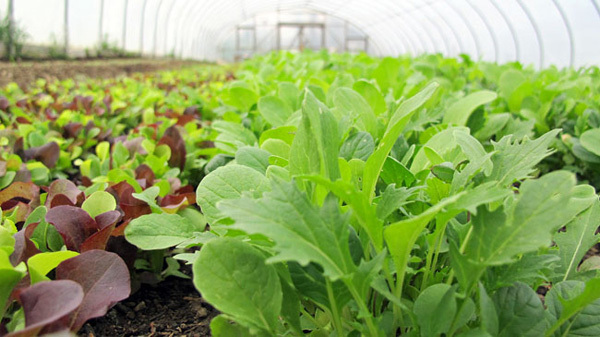 One of the best early season treats for the locavore is a fresh salad made with the first greens of the season. 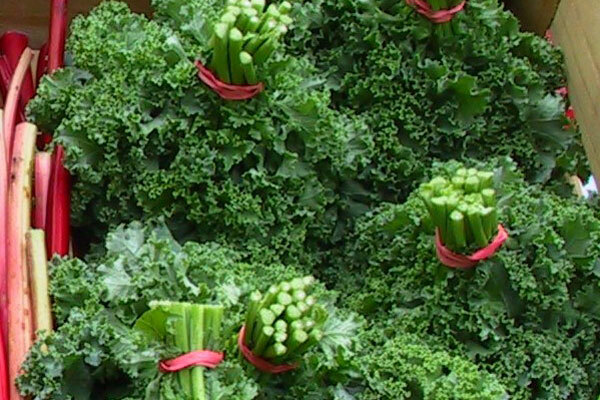 While some might be surprised to hear this, there are three farmers markets going on right now that offer delicious and fresh greens: Boalsburg Farmers Market on Tuesdays 2:00-6:00 p.m. at the Boalsburg Fire Hall, the State College Indoor Farmers Market on Fridays from 11:30 a.m.-5:00 p.m. at the State College Municipal Building Lobby, and the Millheim Indoor Farmers Market on Saturdays from 10:00 a.m.-1:00 p.m. at the Bremen Town Ballroom. March is often a tease to those of us weary of winter’s cold, snow, and ice. One day we may have pleasant mild weather, the next, biting wind and snow. Well, what do you know. During the last several days the weather finally began to resemble spring after what was a pretty cold March, followed by a chilly start to April. Yesterday was especially nice and really got me thinking spring, a time of year that I just plain love. There are two local-food related things that I love about spring time—the first fresh greens of the year and breaking out the grill. While a spring greens salad with a grill burger made from local beef is a nice way to kick off the spring season, I decided yesterday to try to combine greens and grilled meat in one dish. Very well watered would best describe the condition in the fields. Thankfully we have most of the newly planted summer crops on raised beds, which keep the plants up and out of the saturated earth. The black plastic we use to cover the raised beds keeps the soil temperature a bit warmer, the weeds at bay, and the moisture in—all good things if you are a heat loving tomato, pepper, or eggplant. There are certain recipes that have nearly cult followings online, and the Zuni Cafe Roast Chicken and Bread Salad is one of them. I’ve never had it in person, but have heard so many people rave about it that I decided to put my own spin on it. This month we selected three winners for our monthly recipe contest. Congratulations Ruth Nissly, Anne Trout, and Terri Lukens-Gable. 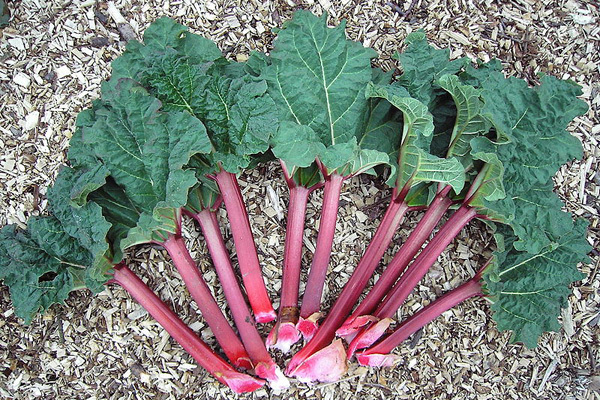 You are the recipients of a pound of rhubarb from Jade Family Farm! 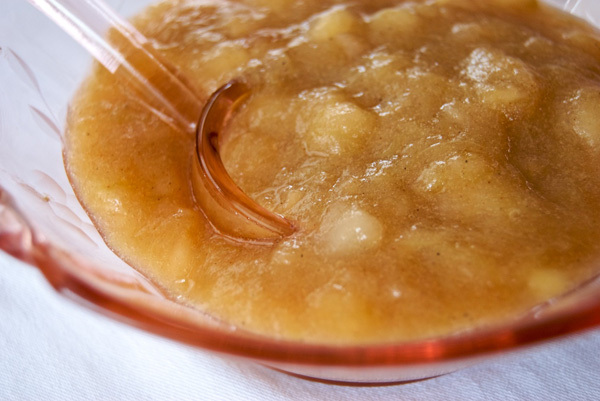 Continue reading to see recipes for rhubarb sorrel crisp, banana rhubarb pie, rhubarb torte, and more. And check back early next week for our June recipe contest! Farming is hardly ever a perfect world. It is often too wet or dry, too hot or cold—but then every once in a while along comes the perfect day. 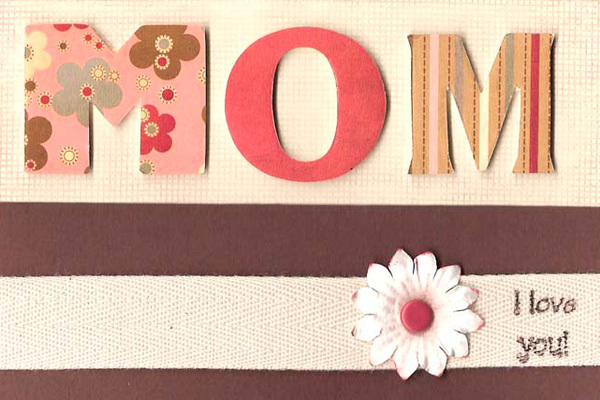 Don’t forget to spoil your mother this weekend! Here are a few recipe suggestions for an extra special Mother’s Day brunch. 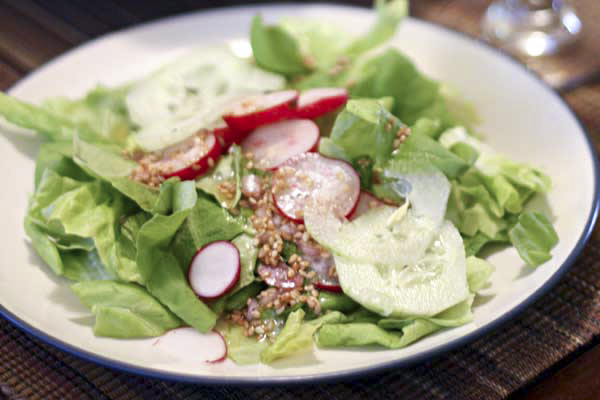 Serve this sweet and tart vinaigrette from Chef Harrison Schailey over mixed greens. 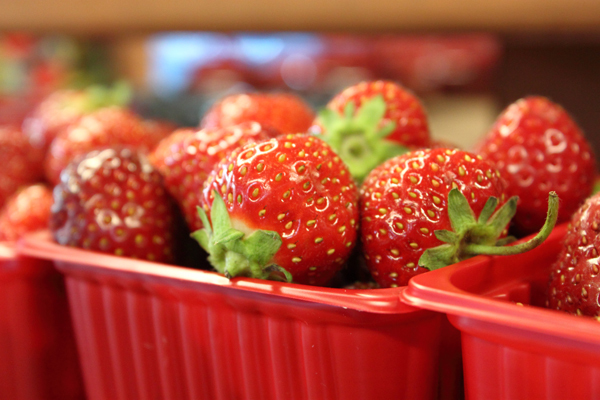 Then toss with sunflower seeds or almonds and local strawberries for a satisfying spring salad. 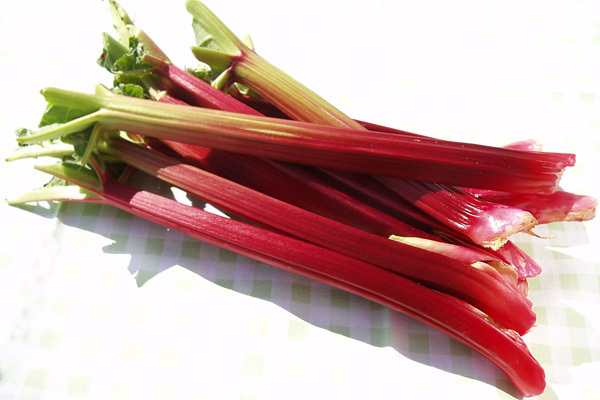 And don’t forget to share your favorite rhubarb recipe! This crazy spring just keeps on coming! Thankfully we are getting a bit of rain to settle the dust and take the dry edge off of everything. The asparagus was starting to come on early last week, but rapidly retreated after a few cold days – so we have a just small amount for everyone. The early spring greens we planted in March are growing and this week we get to enjoy yukina savoy. Between the flea beetles and the extreme temperatures, it doesn’t look beautiful, but it still tastes good. This vegetable needs very little cooking, which makes it perfect in stir-fry, or as a late addition to Asian style soups. One of the best things about belonging to your local Community Supported Agriculture farm (CSA) is how quickly the season gears up — and how big your box of veggies gets. It starts small with bunches of asparagus, spinach, and rhubarb. And radishes, how I love the radishes — they are eaten the minute they get in the house. You start to plan meals based on what needs to be used, rather than what you are in the mood for. But I find that it allows you to become much more creative in the kitchen — matching what you have with what sounds good. This dish is a perfect example. Mid-April felt more like July. 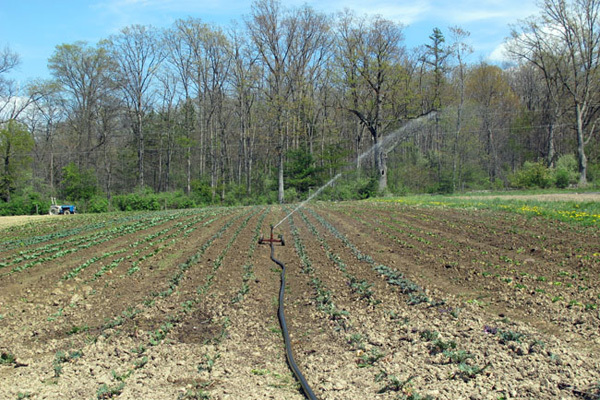 We had full irrigation running on the crops in the fields since the beginning of the month, as we took turns waiting for the next available hose to water a greenhouse. It was dry, dry, dry! Curries fall into the category of totally flexible and easy and cheap weeknight meals. Lentils (or in this case, garbanzos) or Tofu are perfect for vegetarian options — but any kind of meat or seafood protein works equally well. Vegetables can be anything that you have on hand, provided that you have a nice amount of ginger and garlic. If you don’t have coconut milk and Thai curry paste (which take you in the Thai Curry direction), you can go the Indian Curry route and use a good quality Indian/Madras curry powder and garam masala with some broth or water. 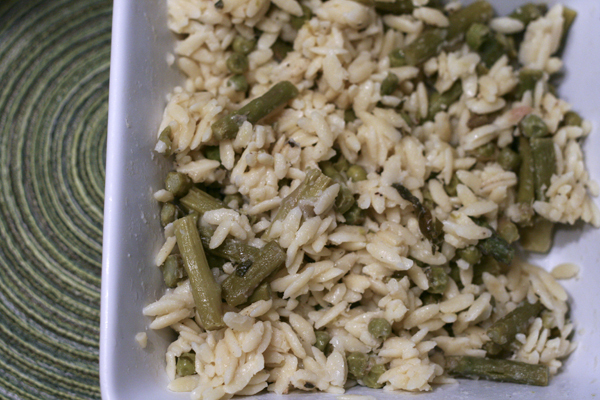 Serve it over rice if you like — or without rice and thick like a stew, or thinned out as a soup. Snow may be falling today, but it is April, and Harrison’s Wine and Grill is serving its seasonal spring menu. The globally-inspired menu includes a few new partners that attended the PASA conference in February—Vale Wood Farms and Clover Creek Cheese Cellar, with several more in the works. Harrison’s now has over 25 local growers and purveyors. See the full list here. 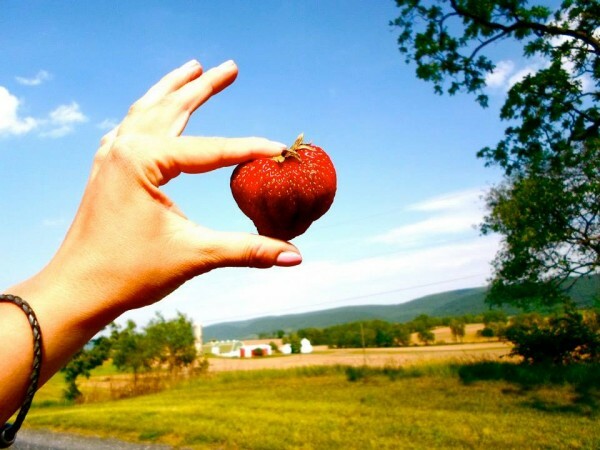 Strawberry season is my favorite season; though it is a short one. Throughout the month of June, I enjoy strawberries on my morning cereal and swirled into yogurt, tossed with spinach salad, on top of shortcakes and waffles, and layered with vanilla cake and cream cheese frosting. We also currently have four quarts in the freezer just begging to be thawed and consumed. 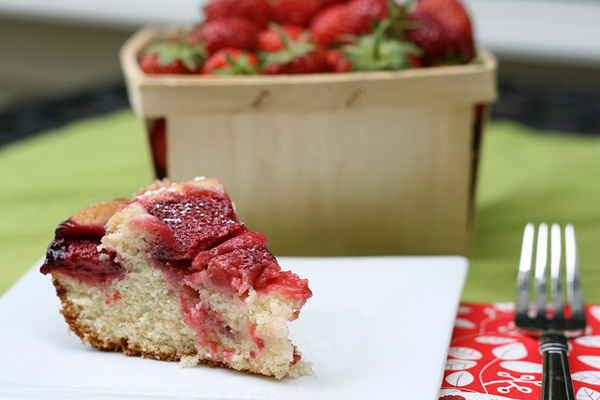 Have you submitted your favorite strawberries recipe for the June contest? Share it today for your chance to win a $25 gift certificate to Harrison’s Wine Grill in State College. Enjoy this favorite from Tait Farm Foods. What is better than crisp vegetables, creamy dressing, and fluffy pasta? Primavera means “the season of spring,” and this recipe uses fresh vegetables that are grown locally during this time of year. The delicate dressing and pasta really highlight the diverse tastes, textures, and colors of the seasonal vegetables. 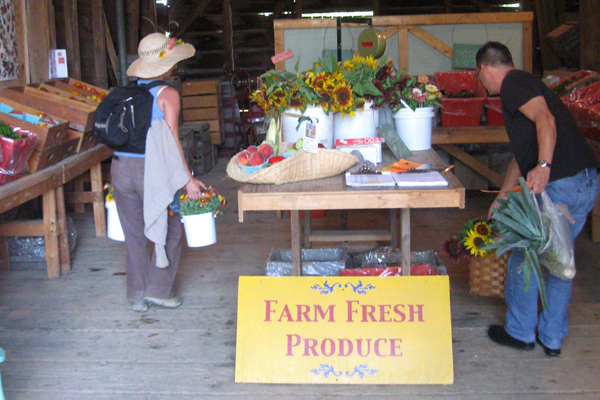 Tait Farm’s CSA, Community Harvest, kicked off its main season in mid-May with a bang! To see the excitement on our CSA members’ faces when they picked up their “share” of asparagus, Swiss chard, salad mix, and more was so gratifying. We work hard to produce this food, and people couldn’t wait to get home to eat it. 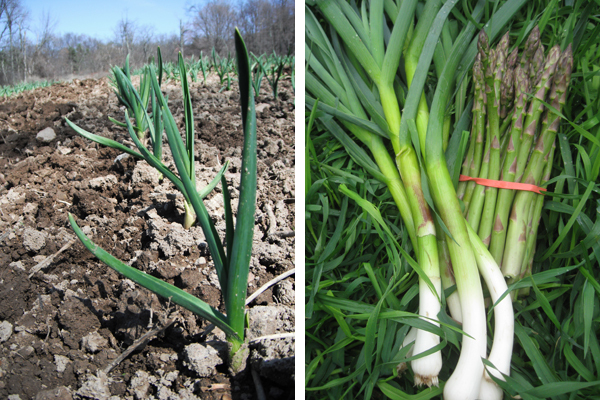 Ideas spouted left and right for favorite green garlic recipes and grilled asparagus. 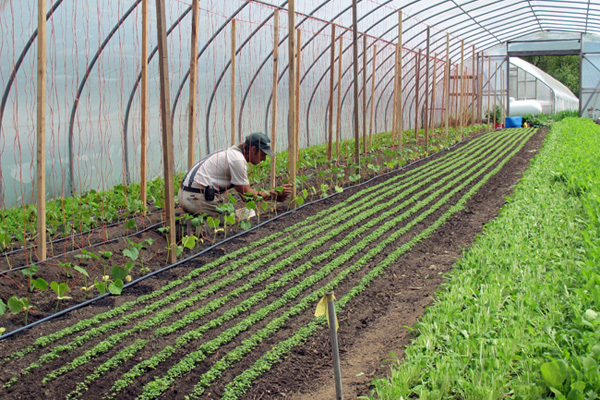 It’s a comforting bustle of people who love being a part of our CSA. Eating is something we all have to do everyday anyway, and when the ingredients are fresh, organic, and seasonal, it adds a whole other ingredient to the meal: contentment. Green garlic is the early spring garlic that eventually turns into the normal bulbs of garlic that we all use day to day. Demand for green garlic is growing as more restaurants have added it to their menus and people have discovered its mild, but distinct, flavor. It is still primarily available at farmers markets and farm stands, but you may also spot it at gourmet markets. 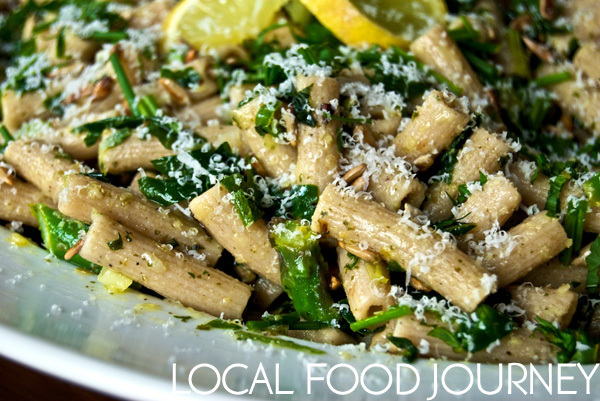 This pesto recipe is the perfect celebration of the arrival of green garlic. Serve it over pasta or spoon it onto grilled bread. Enjoy! 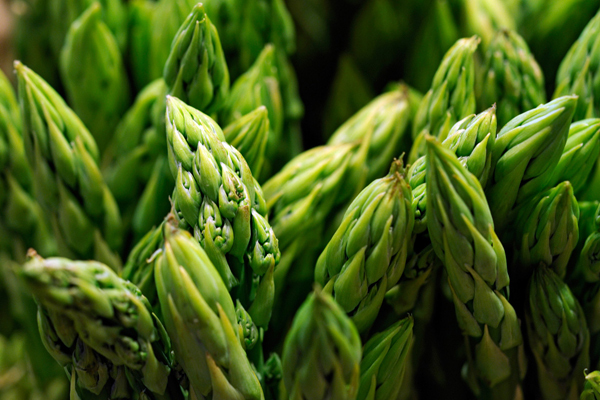 Here’s another recipe utilizing spring asparagus from Tait Farm’s Steve Spanelli. Don’t forget to share your favorite asparagus recipe before Tuesday, May 31st for your chance to win a $25 gift certificate to Tait Farm Foods! There are two times during the asparagus season that I enjoy picking it: the first time and the last time. Don’t get me wrong; I love asparagus in every way, shape, and form on my dinner plate, but the tedious task of picking it twice a day can make a person jump for joy at the end of its season. Have you tried white asparagus? It is slightly milder and more tender than green asparagus and is considered to be the more “gourmet” option of the two. The process for growing it, however, is quite easy. Both green and white asparagus come from the same seed; white asparagus is simply deprived of sunlight. Dirt is piled on top of the plant, which eliminates chlorophyll production and prevents it from turning green. 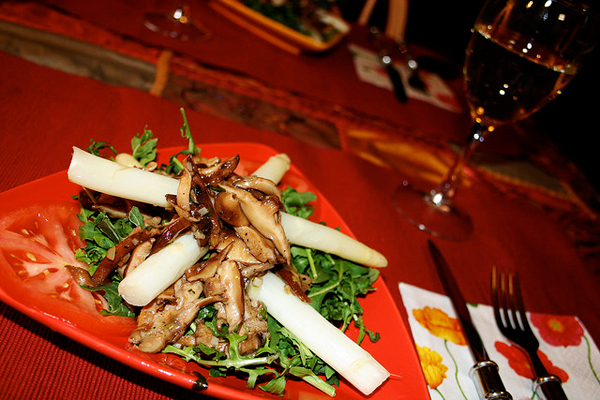 Either white or green asparagus may be used in this salad recipe, though the white provides a nice color contrast to the arugula, mushrooms, and tomatoes. Don’t forget to share your own asparagus recipe before Tuesday, May 31st for your chance to win a $25 gift certificate to Tait Farm Foods! Erin McKinney is one of two full-time farmers at Tait Farm in Centre Hall who oversees the fieldwork for the Community Supported Agriculture (CSA) program, Community Harvest. Find out from Erin what is “growing on” in the fields at Tait Farm this week. 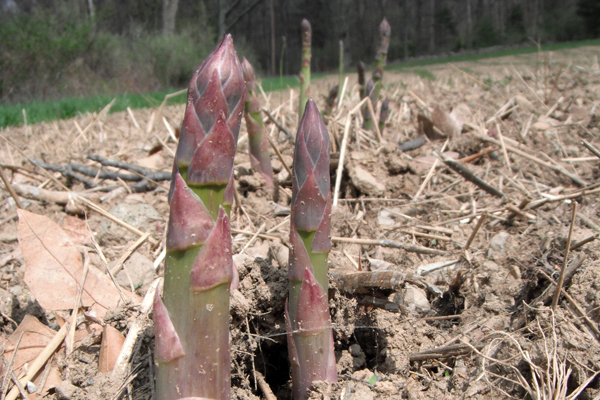 Now that April is upon us, it means that asparagus is coming into season! 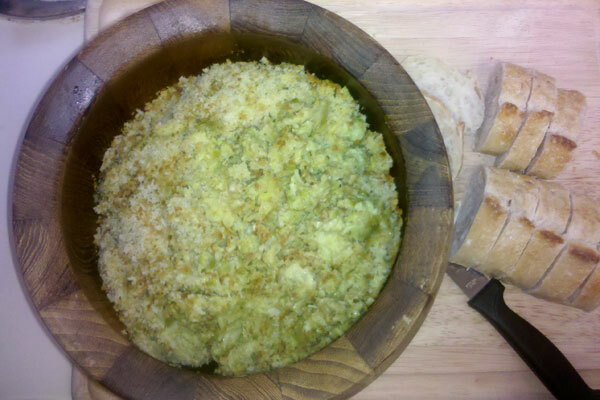 This dip is a quick and easy way to utilize this versatile vegetable. 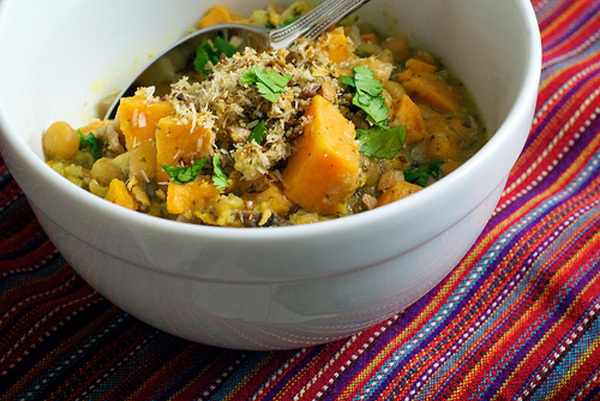 Root vegetables aren’t just consumed during cold weather. The radish is a root vegetable that is available in Pennsylvania during the months of May, June, July, and September. It is during these warm months that the crop is at its sweetest. 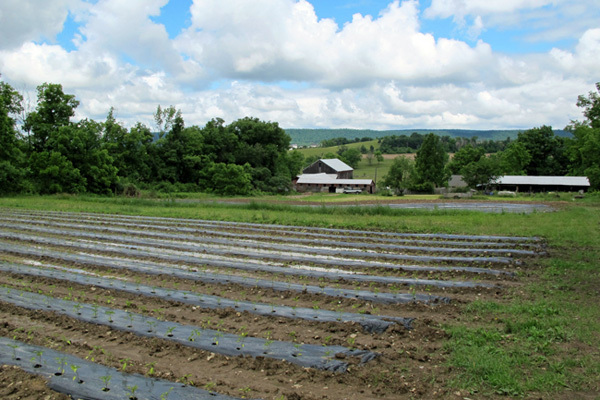 Asparagus and peas are quintessential spring produce options in central Pennsylvania. Both are available at your local farmers market through June when corn and cucumbers will take their turns. Winters in central Pennsylvania can feel endless, especially those that bring several feet of snow. But fortunately we live in a state where temperatures and food choices change with the season. 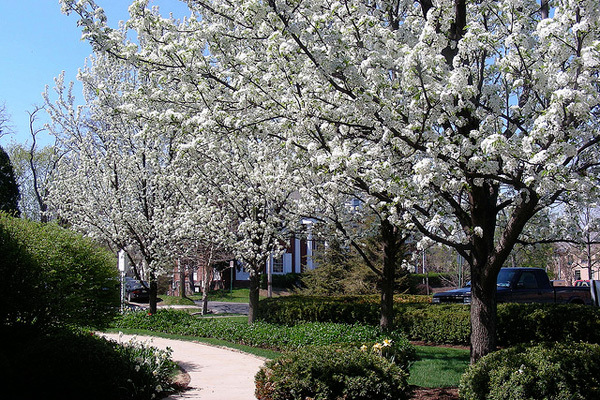 And so we anxiously anticipate the first signs of spring: dogwood trees and flocks of robins and farmers markets.